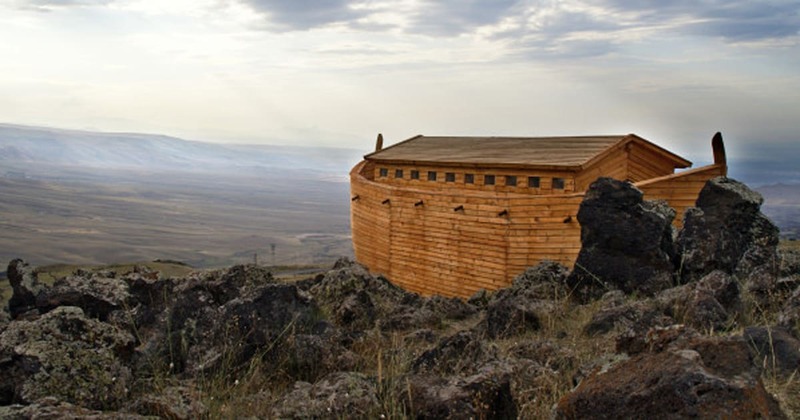 This photographic evidence of Noah's Ark on Mount Ararat has silenced all doubters of the story of the Great Flood. On July 17 the ark bottomed out on Mount Ararat in northwestern Turkey. With nowhere else to go, Noah and his family and the animals waited. On October 1, other mountaintops started to appear. Sensing progress in the recession of the flood, Noah sprang into action and after forty days he started sending birds out to look for dry land. One of the birds, a dove, returned after a week with a freshly plucked olive leaf in its beak, which was nothing short of miraculous itself, since olive trees typically take more than 47 days to grow, much less to sprout leaves. A week later he released the dove again and it never returned, which was risky, since the only other dove in the world was still on the ark, thus risking extinction of the species, which would have earned Noah the eternal gratitude of New Yorkers who get pelted with their excretions to this day. Somehow, that dove eventually found the other one. “I should think so,” said Noah. “Clear those animals out of there, too, Cap’n. Tell them to go forth and multiply.” So Noah strolled up and down the ark’s three decks, chasing all the birds and beasts out, hoping that the lions wouldn’t attack the only two antelopes as soon as they were on dry land, and that the buffalo, penguins and kangaroos would somehow figure out how to get back to their respective continents. All creatures appeared to have filed out of the ark, so Noah gave the ark a once-over to make sure all were gone. He noticed in the bottom of a pen two snakes that hadn’t budged. After clearing the misunderstanding with the snakes up, Noah realized he must make a sacrifice to God, because that’s what you do. So Noah brought the two unicorns, who were ritually clean, and sacrificed them as burnt offerings on an altar he had made for the Lord. When the Lord smelled this barbecue, He felt so good that He promised never to kill all of humanity and all the animals again, no matter how bad they got, figuring that humans were probably smart enough to do that themselves.